Reggie Jones has played cornerback at the highest level, so his comments on 2020 Washington cornerback Kasen Kinchen come from a knowledgeable source. Jones says Arizona defensive backs coach John Rushing had the same impression after seeing Kinchen at a camp last summer. “He said, ‘Man, his hips and feet are phenomenal. For the 2020 class, I think he has the best feet and hips around the country,’” Jones says of Rushing’s comments. The 5-foot-11, 165-pound Kinchen has offers from Oregon and Cal among others at this point. He will be at Notre Dame for a visit along with Jones and a couple other Heir Academy standouts, 2020 cornerback Donovan Clark and 2021 receiver Emeka Egbuka. Jones spent time as a cornerback with the Saints, Redskins and Vikings in the NFL. He’s been in contact with Irish defensive backs coach Todd Lyght and feels confident about how Kinchen would fit in the Irish’s scheme. “He’s the perfect field corner and Nickel for what they’re doing,” says Jones. 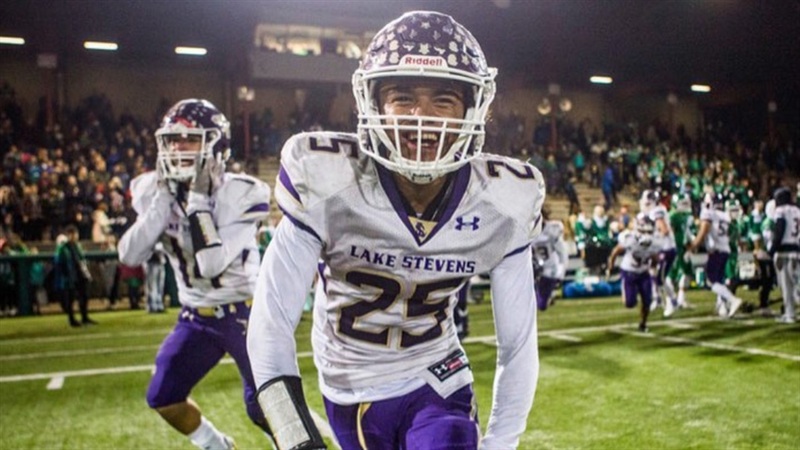 Jones points to Kinchen’s versatility as another positive for the Lake Stevens High School standout. “His natural athleticism is scary,” he says. “He’s going to go and play corner. He’s also going to be able to play Nickel, which is going to provide more value. He can play safety as well. Kinchen takes care of his business off the field and lets his play speak for him on it. “Kasen is very quiet,” says Jones. “It actually took me a while to get him to start talking more. He’s very quiet, but he has a great smile. His smile lights up the room. He’s just not going to say much. Following his trip to South Bend on Thursday, Kinchen will head to Northwestern on Friday with his father, who is also his defensive backs coach at Lake Stevens.